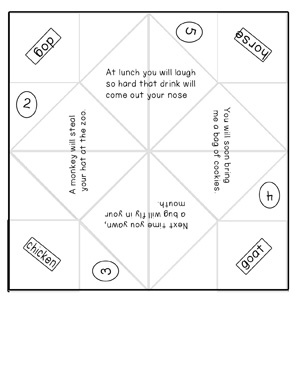 Cootie catchers are great fun for kids to play, and they lend themselves very well to the learning environment. I use them in order to have kids work on writing within small designated spaces, and they can be used to work on counting and review. I have re-vamped my cootie catcher templates to include some with fold lines so that it is easier to know how and where to fold them. I usually have the kids write their own words on them, and then some of the kids can make up their own fortunes on the inside. Other kids want to copy the fortunes that I have already written up. I have also made some pre-written ones so that the kids could just write a very small amount (the word on the front, and the numbers). These cootie catchers have squares that the children need to write in. Any square piece of paper can be made into a Cootie Catcher. Fold the paper in half and crease firmly. unfold. Then fold the paper in half the other direction, and crease again. Fold each corner point into the center. flip it over and fold all four of the new corners into the center. Under the inside flaps, you have to write a fortune or prediction. On top of those flaps, you need to write a number (in the circles). On the outside flaps you need to write a word (in the rectangles at the corners). I often have them write types of animals, colors, or other theme type words. Then unfold and fold it in half the other way. Stick your thumbs and first two fingers into the four pockets on the bottom. 1. Have your player choose one of the top four squares. 2. Spell out the word that was chosen, for example D-O-G opening and closing the fortune teller along with the letters. Open up and down, and side to side. 3. When you’ve stopped opening and closing, the player should be looking at the inside of your fortune teller. He has to choose one of the flaps with a number. You then open and close the fortune teller the right number of times. 4. When done with that, he has to pick one of the panels, flip up the chosen panel and read the fortune underneath. 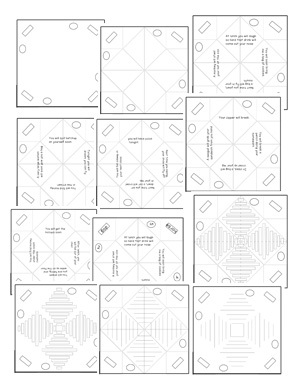 It is challenging for the clients to fold the paper, write in the spaces, and move the fortune teller in the proper manner with their fingers. I have made a list of some of the fortunes that the kids like to use, and have printed these fortunes on the samples.